At the turn of the century, William Abbott Witman Sr. bought ten acres on the southern tip of Mt. Penn. It was his intention to quarry its stone. However, his stone quarrying operation defaced the look of the mountain side. He suffered public criticism and was finally persuaded to abandon his operation. Witman was then shown a postcard of the Philippines by his friend Charles C. Matz, who had then just returned from the Spanish-American War. The oriental structure fascinated Witman so much that he hired Charles Matz and his father James Matz to build a similar structure. It was his idea to replace the damage left by the stone quarry. This new pagoda was intended to be a luxury hotel. In 1908 his "resort" became reality. A red brick and tile pagoda built in the style of a battle castle of the Shogun Dynasty of Japan stood above the city. The interior had red and yellow tile floors and a majestic oak staircase leading to the upper floors. A shachihoko (dolphin) was poised on the rooftop and a Japanese temple gateway, known as a torii, graces the entrance. Unfortunately, the ensuing application for a license to serve alcohol was denied. As a result, the luxury inn never materialized and the building went into the hands of a local bank. 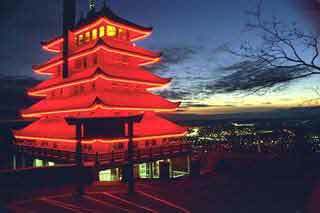 In 1910, the land and the seven-storied pagoda were sold to Jonathan Mould, a prominent businessman. After one year, Mould and his wife resold the pagoda and the surrounding ten acres to the City of Reading for the sum of one dollar. Before the days of regular radio broadcasting, lights flashed as signals from the Pagoda to the people of Reading. The Morse Code was something used to direct firemen. On other occasions, signals were given to further fundraising campaigns and inform the public of the most recent developments in the drive for funds. They were also used to give results of sporting events, such as prize fights and World Series. The Morse Code was based on light signals, instead of sound signals, so a few adjustments were made. A white light represented a dash, while a red light was a dot. A white steady light meant the station was not occupied. A white and red light meant the station was open and prepared to operate. If both lights flickered, a message was about to be sent. If there was a white steady light and a flickering red light, an error was made and the message was being corrected. A steady red light and a flickering white light meant that urgent action was needed for the subject being broadcast by the lights. William A. Witman Sr. ordered the bell through the A. A. Valentine Agency of Broadway New York, an exporter and importer. 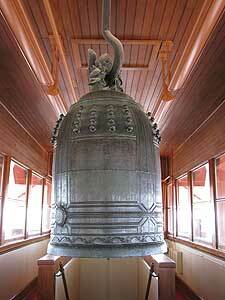 The bell traveled through the Suez Canal and reached New York on April 19, 1907. Traveling from New York by railroad, it arrived in Reading on May 5, 1907. 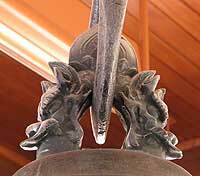 The bell was cast in Obata in 1739 by a man named Mikawaya, who along with 47 other men, presented it to Shozenji (Buddhist Temple) at Yakuosan, now part of Tokyo. Several different translations have been made of the bell's inscription; however, most scholars agree that the inscription contains the names of the bell's donors and a prophesy regarding the end of time. When the bell was installed, it was complete with its original striker. Oriental bells, unlike western bells, do not have clappers. Height: Seven Stories, 886 feet above sea level. Dimensions: 28 feet wide, 50 feet long, 72 feet high. Walls: Five feet thick at the base, tapering to two feet at the top of the second story. From second story to the top, walls are frame covered with terra cotta tile shingles. Roof: Five overhanging with upswept corners. Each recedes two feet from the one below. Portico: Originally of wood, replaced by concrete in 1949. Interior: Walls are of concrete plaster, floors are concrete. Trim is of solid oak, 87 steps lead to the top. By the 1960s weather, fire and the ravages of time took their toll and the pagoda was in desperate need of repair and restoration. 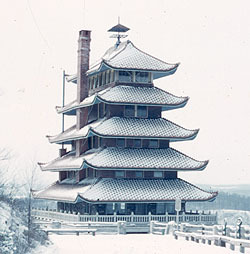 Pagoda-Skyline, Inc., composed of private citizens, was given official city recognition in 1969 as the fund-raising group to work on the project of renewing the pagoda and developing Mt. Penn as a public recreation area. In 2008-2009 the Pagoda again underwent restoration. The fluorescent lighting was replaced with led lights and the public areas and outside were painted.